He is an uncomfortable guest. Egypt’s President Abdel Fattah al-Sisi´s two-day visit to Berlin had been controversially discussed before his arrival in the German capital on wednesday. The former army chief has been under fire for the lack of progress in Egypt’s transition to democracy, a high number of death penalties and his brutal persecution of Muslim Brotherhood, demonstrators and journalists after seizing power by force in July 2013. 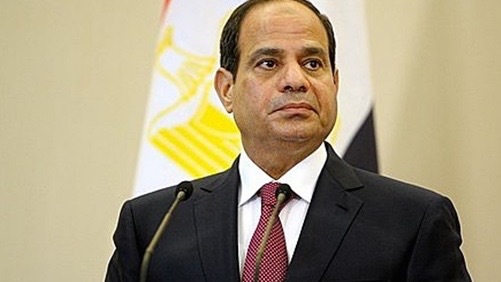 According to reports of international human rights organizations the situation in Egypt is even worse than it was under former dictator Hosni Mubarak. All that seemed forgotten when German President Joachim Gauck welcomed al-Sisi with full military honors at Berlin’s Bellevue Palace. The following press conference with chancellor Angela Merkel however ended in a scandal when a female reporter loudly called al-Sisi a Nazi, a fascist, a murderer. She was immediately removed by security while Egyptian journalists wearing buttons with al-Sisi´s portray almost collectively jumped up shouting „Long live Egypt!“ over and over. Shortly before the visit several human rights organizations including Human Rights Watch and Amnesty International had addressed a joint letter to the German chancellor urging her to address human rights violations. Merkel did – even though restrainedly – by denoting the more than 742 death sentences under al-Sisi as something that „needed to be avoided“. Al-Sisi said he respected Germany´s perspective but wants Egypt´s „own perspective“ to be respected equally. Adding that „our constitution is more than hundred years old. We respect judiciary and cannot question the rule of law.“ How comfortable to see it that way.